This is our custom-built XLRM to XLRF Extreme grade microphone cable. Construction is Neutrik XLRs with Mogami 3173 cable. Neutrik connectors are some of the best connectors around, with no screws to fall out after years of abuse. Mogami cable is the best wire, used in the best studios for its ultimate sound qualities and durability. Mogami 3173 cable is fairly flexible, moderately durable, ultra heavy-weight cable. If you are on more of a budget, you might consider the 2549 cables. 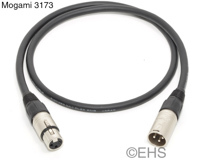 Not to be confusing but Mogami 3173 is actually AES/EBU digital wire but with specs better than any of Mogami's other wires. This cable makes a fantastic mic cable. It has 18 gauge conductors so only a fraction of the resistance of any of our other balanced wire types. The capacitance and inductance specs are amazing. If you're crazy about your audio, this is the cable for you (and you can use it for your AES connection if you ever need to).